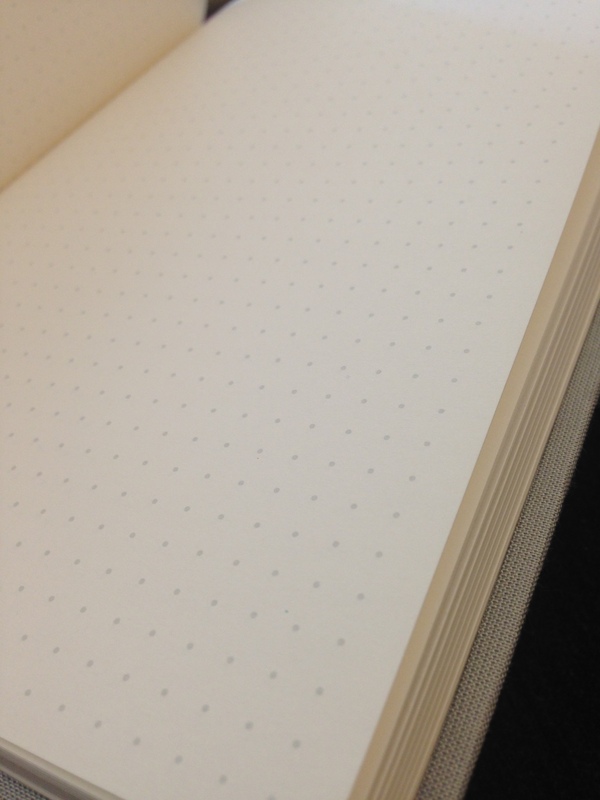 The first thing I noticed about Baron Fig’s Confidant notebook is that the paper is a delicious off-white. The paper’s thickness is perfect: there’s not very much writing bleed-through at all, even when using a Pilot G2 07 gel pen. That’s probably my first desideratum in a notebook, and Baron Fig nails it here. 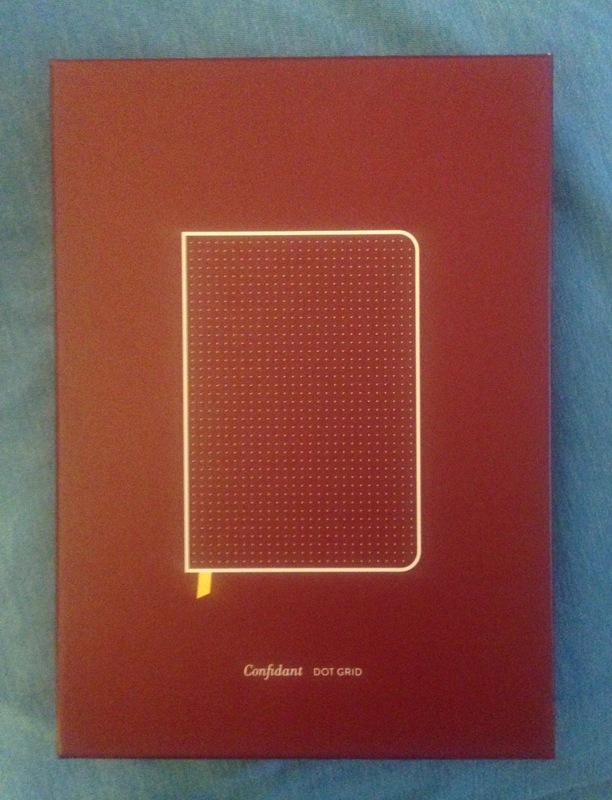 The Confidant comes with blank paper, ruled paper, or dot grid paper, which is what I reviewed for review. The grey dots are visible and usable as guides for diagramming or sketching or writing… but they’re also subtle enough to stay out of your way. A great balance here. The acid-free paper means the book is built to last. And the dimensions just feel perfect to me: 5.4 by 7.7 inches. It’s 192 pages, with 12 pages at the back of the journal which are perforated. In other words, it’s enough space to keep you supplied for a while, but not so much that you’ve got a bulky journal to carry around. The portability is right on. The cloth cover looks and feels good. The binding is sewn (yes! ), which is, of course, one reason it lays flat so well. 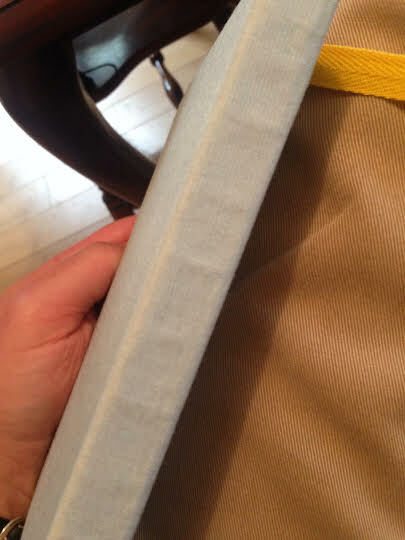 I was not as impressed with the aesthetic of the binding: I thought it could have used maybe a thicker piece of cloth to cover up the binding construction that is so easily visible? I might just be missing that the look is intentional, but it didn’t appeal to me. The Confidant notebook comes with a ribbon for marking your place. I greatly appreciated this. It is about twice the thickness of most other ribbon markers, though, so it felt to me like it was out of step with the rest of the notebook. I have gotten used to this over time. Overall, the critiques above notwithstanding, I’ve had a positive experience using the Confidant, which gives me a notebook I really do want to reach for and write in! It goes with me in my satchel just about everywhere I go now. You can learn more about the Confidant here and order it here. 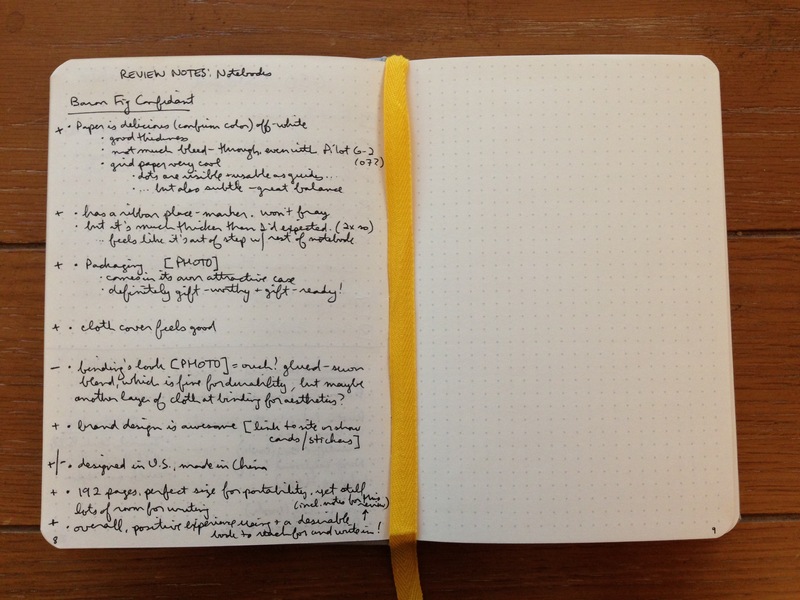 Bonus paragraph: Baron Fig also makes the pocket-sized Apprentice notebook, which I think is an A+ in its class. It fits perfectly into even small pockets and isn’t a nuisance there. I’ve been carrying one of those around, too, so I don’t have to whip out a device every time I want to write down an action item I’ve committed to. The 3.5″ by 5″ little guy comes in a three-pack. More info on the Apprentice notebook is here; you can order here. 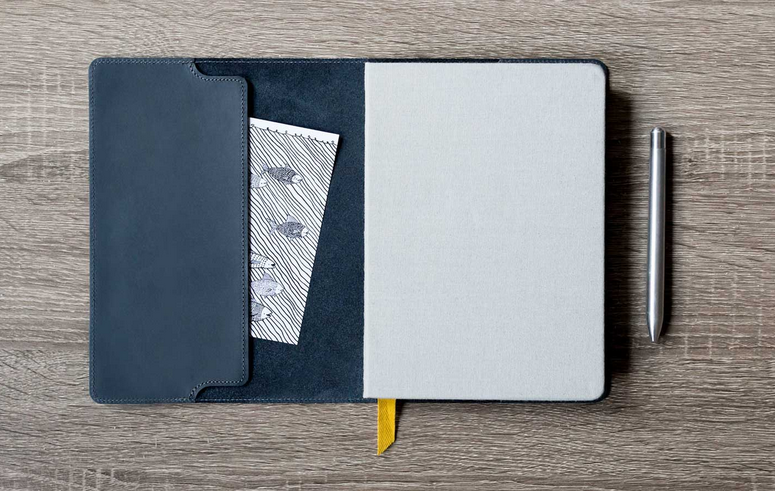 Many thanks to the awesome people at Baron Fig for the notebooks for review! Check them out here.